It wasn’t pretty, mistakes were made and key players were injured. Yet while football is a game full of details both small and insignificant, all that really matters is the final outcome. In a game that many, including our own “experts” believed they would lose, the Eagles came out on top in a thrilling 24-23 victory over the Baltimore Ravens. Things started off smoothly for the Birds on the opening drive, as the Eagles offense looked to prove they had made the proper adjustments following their shaky performance against the Browns. Vick made sharp passes, leading the team down the field into the red zone. Things quickly took a turn for the worse however after Vick’s pass to the endzone was intercepted by safety Bernard Pollard. But the Eagles quickly bounced back after Trent Cole slapped the ball away from Joe Flacco. The Eagles recovered the ball and took advantage. LeSean McCoy ran it in for his first touchdown of the season, putting the Birds up 7-0. The Ravens tied it up with around 2 minutes left in the 1st after Ravens fullback Vonta Leach ran it in for the touchdown. Things were testy throughout with multiple scuffles between players, including repeated confrontations between DeSean Jackson and Ravens cornerback Cary Williams. The Eagles turnover woes continued. A botched handoff between Vick and Bryce Brown resulted in a fumble. The Ravens took advantage as Flacco connected with Jacoby Jones for another touchdown, putting Baltimore up 14-7. Things only got worse for the Eagles in the half. After an impressive drive, LeSean McCoy fumbled the ball for the second time this season. A 56-yard field goal from kicker Justin Tucker put the Ravens up 17-7 at the half and the Eagles walked off the field hearing a scattering of boos from the frustrated crowd. Whatever Andy Reid said to the Birds in the locker room seemed to have worked as the Eagles came out in the second half looking like a different team. It began with the defense. DeMeco Ryans continued his strong defensive play, picking off Joe Flacco early in the 3rd quarter. The offense picked up as well. Proving that he still has a knack for the spectacular, Vick connected with Jeremy Maclin while rolling out for a dazzling 23-yard TD pass. Another highlight came from Brent Celek who is sure to make the Sports Center top 10 when he hurdled over Ed Reed after catching a sharp Mike Vick pass. An Alex Henery field goal later in the 3rd tied things up. The rejuvenated play from the Birds was overshadowed however by a string of 3rd quarter injuries. It began when Center Jason Kelce injured his right knee. He appeared to be unable to put weight on the knee as he was helped off the field. Offensive Tackle King Dunlap also left the game after injuring his hamstring. Jeremy Maclin, already dealing with a hip flexor strain from last week suffered another hip pointer. Finally, Defensive End Jason Babin was helped off the field. It’s unknown how serious Babin’s injury is. The quarter ended wildly as momentum quickly swung from one team to the other. 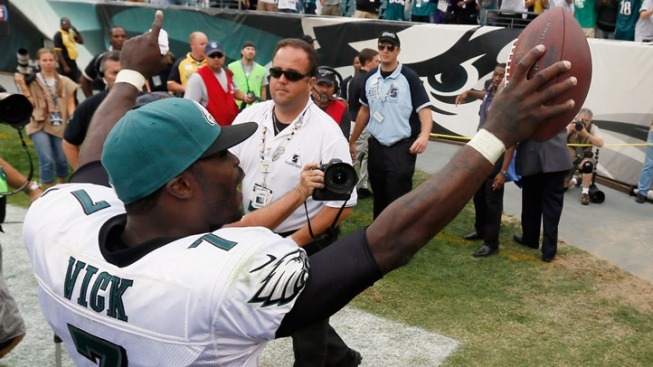 Vick connected with DeSean Jackson for a 50-yard bomb. The Ravens regained control however after Ed Reed intercepted a Vick pass that bounced off Brent Celek’s hands. The Ravens struck first in the 4th quarter after a 51-yard field goal from Jason Tucker put them up by 3. The Ravens nearly put things away for good with 5 ½ minutes left after Flacco connected with Jones in the endzone. However, the TD pass was called off due to offensive interference. The Ravens settled for another field goal, putting them up 23-17. Just like last week, Vick came through when it counted the most. The QB led the team down the field into the red zone. Things got tense when the refs ruled an incomplete pass as a fumble around the 2 minute mark. The refs overturned the call however as replay clearly showed it was a forward pass from Vick. The Birds took advantage of their second chance as Vick rushed in for the TD on a quarterback draw. An Alex Henery field goal put the Birds up 24-23. It was then up to the defense to win the game for the Birds. Just as they had done all second half long, the Birds defense came through, stopping the Ravens and icing the game. The issues that were raised during the season opener remain. The Eagles still struggled with turnovers while Vick once again made questionable decisions throughout. Yet this time around, the pros far outweighed the cons. Despite two interceptions (with one bouncing off Celek’s hand), Vick was much better this time around, going 23 for 32 for 371 yards and one touchdown. 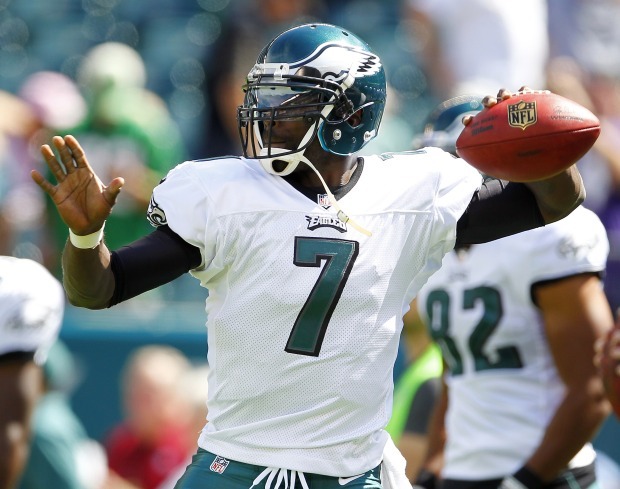 Vick once again delivered in the clutch, completing his second straight game winning drive. While the defense was a bit shaky in the first half, they were dominant in the second, holding the Ravens to only 6 first half points and making life miserable for Joe Flacco who finished 22/42 with 232 yards, one touchdown and one interception. The Eagles certainly still have a lot of work to do. In two games they already have 9 total turnovers. Another major concern is injuries, with the status of four major players in question. Yet the most important stat is this. Despite all the problems and sloppiness, the Eagles are 2-0. And unlike last week, they beat a team with legit Super Bowl aspirations. Eagles fans have a lot to be concerned about. But after Sunday’s victory, they also have many reasons to be excited.